This week, I’ve been working on updating the “Banting House” Wikipedia page. It had a small amount of information on it, so I figured it could use some new contribution, especially since it has become part of our presence on the internet. What I didn’t realize when I started was how long it would take! I needed to find the original sources for everything I added to the article – it’s a good thing we have so many newspaper clippings here! I also had to make sure I was writing in the right style for the site, and learn how to use the template codes that were provided for editing. After working on the article for a couple of hours, giving a tour to some new visitors is a welcome interruption. Between the two though, I’ve been keeping busy this week! Since I’ve had to do a lot of research for this project, I thought I’d share some of the most interesting things I learned this week while flipping through articles. First of all, the Sir Frederick Banting comic book exhibition – Three Stories. One Life. Banting’s Biography and the Comic Book Aesthetic, in the Francis Ruth Lawson Gallery right now was opened the day after last year’s Free Comic Book Day – a yearly event that keeps the Old East Village bustling, where participating stores give away free comics and put on great deals. I love a lot of comic book oriented things, so imagine how excited I was when I learned that one of the artists for “World Famous Heroes,” one of the comics featuring Banting, went on to work on DC Comics! 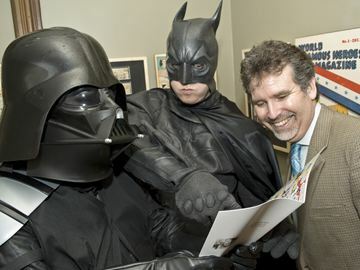 I was also pretty impressed to learn that my boss made friends with Batman and Darth Vader when he opened the gallery. I also learned that there’s a crater on the moon named after Sir Frederick Banting. Last year, Banting House NHSC had a stargazing event, using telescopes to see it (they also got a great view of Saturn)! We’re thinking about making it a yearly occurrence. One of the most surprising things I learned is that it took 61 years for Banting House to become a museum, from the time it was first suggested, to its initial opening. It amazed me a little bit, how long it takes us Canadians to honour our heroes sometimes. Overall, I learned a LOT this week. I learned how to use template codes, I learned how to write in an encyclopedic style, and I learned that sometimes, when you think something’s going to take you an hour or two, it takes a week – but it sure feels great when you’re finally done! Oops – I have to go, I’ve got another tour! Come and join us when you have a chance! This blog was written by Siena McLachlan, Special Events Assistant/Interpretive Guide at Banting House NHSC. Siena specializes in English Literature and Creative Writing at Western University. Posted in Behind the Scenes at Banting House.Tagged Archives, Banting, Documents, Exhibits, History, research, tours.